Voltage is critical! You can check what type of voltage your battery will need by a simple equation. In the battery compartment, locate the number of holes present on the battery. It should be either 3, 4, or 6 holes. Take that number and multiply it by 2, since each hole on the battery is equal to 2 volts. With that answer, multiply the voltage by the total number of batteries in the golf cart (this will either be 4, 6, or 8). The voltage of golf cart batteries is typically 36V and 48V. Pick the right type of battery. There are several different styles, the most popular option being a wet cell battery, or otherwise known as a flooded lead-acid battery. Other options are AGM, and Gel Lead Acid batteries but aren't necessary for everyday use. Capacity must be minded! Always remember that batteries need to produce a parallel connection to make sure your golf cart battery is running at increased capacity. Don't get that mixed up with the voltage, as it doesn't affect that. Don't let the price push you away. Going for the cheaper option isn't going to be the best option. It might be a temporary solution, but it could lead to more issues if the battery isn't adequately protected. This is especially true when it comes to used batteries. If you need a quick surge of power to get from point A to point B and that's it, it may be passable. But as for daily transportation, this is a huge no-no. A higher priced golf cart battery will typically end in much better results and with you getting the most bang for your buck. It's also a good idea no matter what kind or how many batteries you get, to make sure there is a warranty available. This protects you, the consumer, from any issues with a defective battery and allows for peace of mind in your daily travels. Although a golf cart battery is much different from a car battery, they aren't difficult to understand. 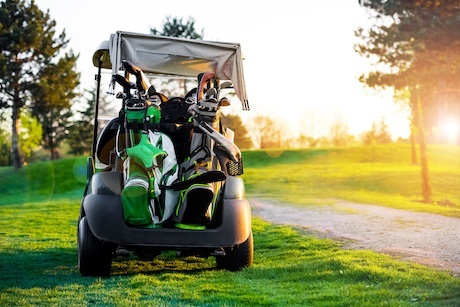 Next time you need to replace the batteries in your golf cart, do so now with a better understanding of what you're looking at and what your money is being spent on. Battery Power has every kind of battery imaginable! Stop by and see us for all of your battery needs.